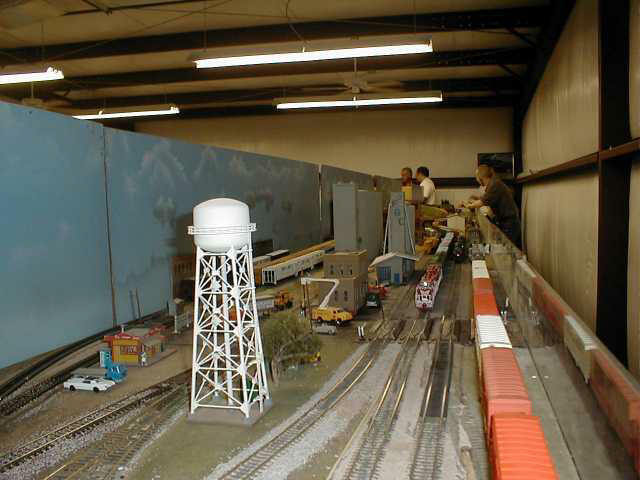 A group of modelers all interested in HO scale railroads founded the All Points North Model Railroad Club in 1981. The "north" in the club name signified that the club was composed of members residing in the northern portions of the metropolitan Houston area. APN was incorporated and qualified as a 501-c-7 not for profit organization. For some time, APN met wherever it could, mostly at Larry’s Hobbies. In 1992 the club rented space at 121 Lou Lane in Spring, TX, a small community just north of Houston, and centered in the club’s membership area. 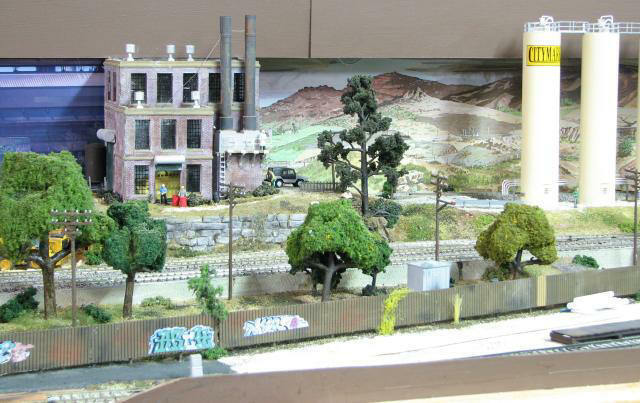 APN now had a "club house" and set up a modular layout. Each member was given a key so they could run trains whenever the mood struck, even if it was due to insomnia at 2:00AM. APN participated in the GATS (Great American Train Show) shows and had regular meetings and open houses at the clubhouse, and the club grew. In 1996, the landlord received a better offer for the space APN occupied, but did offer a smaller space in the same facility, which, while not ideal, was at least tolerable. The club continued to prosper and over time earned the reputation as one of the best model railroad clubs in southeast Texas. In 1997, we were advised that the building was being sold to the adjacent church and we must vacate. At the close of the GATS show the following month, the club’s assets were parceled out among the membership for storage and all members were urged to diligently search for suitable and affordable space. Finally, APN located an empty building, only a few blocks from our former clubhouse on Royal Oak Drive, and made an offer to rent about half of the space in the building. The offer was accepted, but the space was indeed a "mess." The structure of the building was sound, but the interior was a maze that appeared to have been occupied by a series of failed businesses. Fortunately, the interior walls were non-load bearing and the owners had no objection to their removal. So several "work sessions" were scheduled to clear interior partitions, repair lights, and in general just clean up and paint. Once again, APN set up our modular layout and distributed keys to the members. A club with no clubhouse has a very real problem holding its membership together, and so we felt we had escaped a close call. Things settled down, we were attracting new members again, and life was good. We continued to set up our modules at GATS, the Greater Houston Train Shows, and any other opportunities to raise funds. We continued to hold an annual "Birthday Party" each July and a Christmas party in December. These were usually held at various members homes. Meanwhile, a small church rented the other end of the building, As one of the building’s owners, who operated a foreign car repair business next door took a liking to "watching the trains run" (he was invited to come as often as he liked), so we felt some small measure of security. Nevertheless, we had learned a tough lesson; the leadership was increasingly thinking in terms of eventually owning our own property. We had no doubt that if someone offered commercial rent rates for our space, we would be gone. And sure enough, and all too soon, we received the same message, the building was being sold, and perhaps as a message, once again, it was to a church. In November 1998, APN rented storage space for our belongings and set about searching for new space. The amount of rent we could afford precluded commercially competitive rent, and that limited our choices greatly. Our monthly meetings continued on the third Friday evenings and were at Larry’s Hobbies once again where one of the owners happened to be a member of APN. At one point, we appeared to have a deal with the operators of the storage business. They were expanding and we reached a tentative agreement to modify a portion of their expansion to suit our needs. But it soon became apparent that the headquarters people didn’t see eye to eye with the local manager. At another time, we thought we might reach an agreement with the City of Conroe. 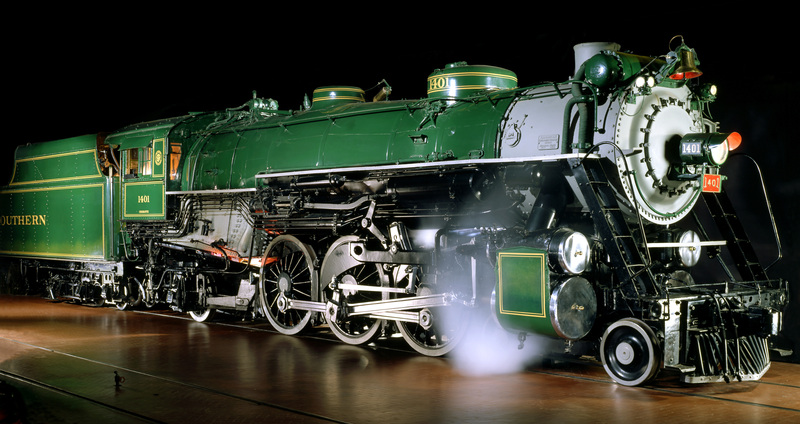 Conroe was in a downtown revitalization project, and as railroads have been significant in Conroe’s history, the city was considering a model railroad museum and, presumably due to our reputation in the modeling community, wanted APN to build and operate the railroad. This was exciting as we could almost see in our mind’s eye something like a smaller version of the San Diego model railroad museum. There was much talk but, when it came to providing real estate, no action. As months went by and our search for rental property remained unfruitful, our treasury grew by virtue of no rent payments. Our thoughts turned more towards the possibility of purchase. APN’s board came up with a budget, which would make this possible if we could find suitable land. The major limitations were price and deed restrictions. Any subdivisions were likely to have "single family only" restrictions. And, of course, any commercially desirable locations would be totally out of our price range. All members were repeatedly urged to search far and wide both for possible rental space or land for sale. Any possibilities located were to be reported to the officers. The officers almost acquired a full time weekend job of checking out possibilities. One possibility after another fell through for one reason or another. 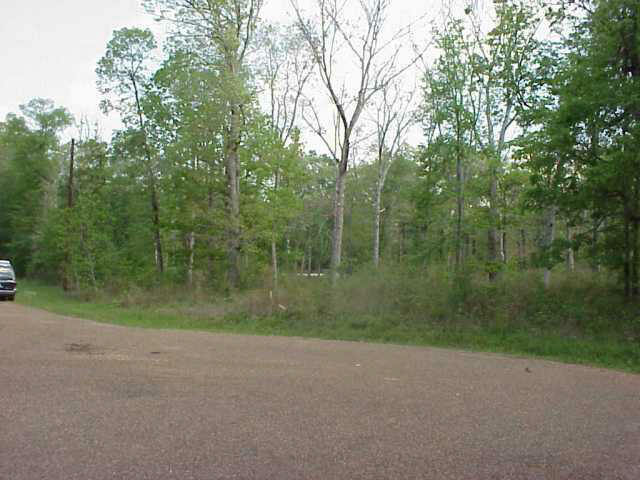 Finally, a lot just east of Conroe was found with a "for sale" sign. Inquiry confirmed it was still available and the price was, but just barely, in our range. The size, at 2 acres, was more than ample for our needs, now and in the future. The other structures on the road suggested no problem with our intended purpose. Steve Hashagen, President, and Charlie Richmond, Vice President, talked to the sellers and also to the owners of the adjacent lot who were then building a new home and both stated there were no restrictions. Various members looked into such issues as flood plains, water table, septic system requirements, etc. From past experience, everyone was waiting for the other shoe to fall. But all continued looking favorable. Tentative agreement was reached with the sellers, and a vote was taken at the July 1999 meeting to purchase the property and proceed with planning for construction. On August 12th, Steve Hashagen and Bob Miller, Member at Large, signed an Earnest Money Contract and presented the contract along with an earnest money check to the Montgomery County Title Company. Under "special provisions," we inserted the intended purpose for the property and that the earnest money would be returned if any conditions would preclude that use of the property. On the 16th, Steve got a phone call from the Title Company indicating they had found restrictions. A copy was faxed to Steve, and did indeed require single family residences only. However, there was an out; the trustee, Roland S. Torn, and/or owner could allow a variance. A phone conversation between Steve and Bob established procedures each would pursue to try to locate the trustee. We knew the sellers were aware of our intended purpose and had no objection. The wording was "and/or," but prudence required we make every effort to make it "and" rather than "or." Steve’s call to the seller asking her to look through their purchase papers proved fruitful. A name of H. P. Albrecht along with a phone number was found with their papers. Steve called Mr. Albrecht and asked to speak to Mr. Torn, and was told Mr. Torn had died the previous Friday. Bob called back and asked for an appointment that afternoon, and Steve and Bob went to Mr. Albrecht’s place of business and explained our needs. Mr. Albrecht said he could see no problem with our intentions and would get Mr. Torn’s widow’s signature as soon as possible. It developed in further conversation that Mr. Torn and Albrecht were partners in the development of the subdivision and therefore, as a partner, Mr. Albrecht’s signature would be binding on all partners. It was agreed that Steve would prepare a variance agreement, obtain the signatures of the sellers, and return Monday for Mr. Albrecht’s signature. This was done, and the property for our clubhouse was purchased and paid for in full. Following the land purchase, three committees were appointed. One was to look into best placement of the building on the land, utilities, county requirements, and placement of a culvert at the site entrance. The second was to look into cost of the building, contractors, and internal organization of the building. The third was to plan the layout to be eventually built in the clubhouse. The layout committee obviously could not do anything more than generalities until the building committee came up with the dimensions available for the layout. Nevertheless, there was much to be decided prior to the actual drawing of the layout. Questions such as time period, scenery style, single or double track mainline, and many others, had to be considered. A questionnaire was prepared and distributed to the membership. Tallies of the responses indicated a generally close opinion as to what the club wanted. It was decided that there would be no crawl-unders or duck-unders as that was not conducive to members with handicaps. Therefore, that led us to thinking in terms of a large letter "E", perhaps with more fingers, as the basic planning idea. Meanwhile, the building committee contacted as many metal-building suppliers as we could find. Obviously, we had competing factors. We wanted as much building as we could obtain, but just how far could the budget be stretched? The overriding factor was that we could not financially exceed what could be clearly handled by the club. We did, however, want to insure that future expansion would be feasible, so we elected to have the east wall self supporting to facilitate any future expansion. All the bids were in a fairly narrow range, however, only one offered to handle all details of construction and his bid was not much above the others. We quickly concluded that there was far too much opportunity for finger pointing among subcontractors for any potential problems if we chose to be our own general contractor. The amount to be saved by subcontracting was not nearly sufficient to offset the risk of, for instance, having the concrete slab to be off an inch from what the building required. We chose the 50’ by 50’ building plan offered by the general contractor. Then we tackled questions such as how many exterior doors, and how much of the space should be allocated to administrative needs. The building committee at that point advised the layout committee the space allocated to the layout itself and where access doors were needed. As we were now seriously committed to ownership of our own clubhouse, the question arose as to the appropriate handling of interest in rejoining APN by any former members and of prospective new members. As a series of three assessments was approved by the membership, allowing former members to rejoin assessment-free would be unfair to current members who had contributed hundreds of dollars. We had lost several members for various reasons; some thought we were smoking something not purchased at the local tobacco shop, others didn’t believe it could be done, and others didn’t care for the idea of community ownership. The question of the handling of former members was quite different from that of new members. Therefore, two issues were submitted to the membership; the first was that any former members wanting to rejoin would be required to pay dues from that date as well as pay any assessments missed. All former members having left in good standing were sent a letter advising the requirements of rejoining APN. The second was that new member applications were to be accepted but not acted upon until we were actually in the new clubhouse. This last requirement was because we did not want the possibility of anyone believing we had promised more than what was delivered. These prospective new members were, of course, invited to attend all activities and participate in discussion, but would not be members and could not vote. We also voted that new members would be on probation for a 4-month period before consideration of acceptance as full members. This was to insure compatibility with present members, to allow us opportunity to see how well personal property was respected, and how actively the prospect participated in club activities. During the 4 months, either party could terminate with the application fee refunded in full. At the end of the four months, the prospect could apply for permanent membership along with the initiation fee and, if accepted, receive a key to the door. How to finance construction was the next major question to be addressed by the Board. With the land paid in full and the treasury in good shape through retained dues and assessments, the Board could see three possibilities for the balance needed to pay for the construction. First would be commercial financing which was the most obvious but probably the most troublesome. As a not for profit organization with no income other than dues, we would not be a highly attractive prospect for a lender even as landowners and with a substantial down payment. Consequently, we could expect a higher than usual interest rate. Second, would be to borrow from a private source. This would probably allow more flexibility and likely a better rate. And finally, why not borrow from ourselves? If we could get pledges for an average of a bit over $1,000 from each member, we would have the funds needed to construct the building along with A/C, water, and septic. This would offer a number of advantages. First would be a better interest rate, which would basically be whatever we offered ourselves. Second, in event of an unplanned financial need, we could elect to delay repayment for a while. And, finally, it would offer a greater sense of accomplishment when the membership saw the completed clubhouse knowing that we had done this "in house". With this self financing option, we would keep the pledge units low at $500 to allow all who wanted to contribute to be able to do so and there would be absolutely no compulsion to participate. Each $500 would be known as a "stake" and hence those contributing would be "stakeholders." At the end of each year, the club will examine the treasury and would conclude how many stakes could be paid off at that time. Each stake would be numbered and numbers would be drawn from a hat equal to the number to be paid off that year. Only the President and Treasurer would know how many stakes each member held. After considerable discussion among the Board members, we agreed to present all three possibilities to the membership at the next meeting, even though we considered the self financing option the more preferable. These three financing options were offered to the membership at the following meeting, and the stake concept was easily accepted. Sufficient stake pledges were tentatively offered to make the option viable, and soon sufficient pledges were in hand cover the cost of construction. In June the portion of land needed for the clubhouse, parking, and driveway was cleared and plans were underway for pouring the foundation. As property owners, the club By Laws had become obsolete, so the Board spent considerable time considering what provisions would best serve our new status. A number of drafts were produced and considered until we thought we had it right. The new By Laws were presented to the membership and accepted after only relatively short discussion. Only minor amendments have since been required. In July, the contractor was advised to pour the foundation, and the slab was shortly there for all to see. Tangible evidence of a clubhouse to be was an exciting event for the membership. The contractor was told we would let him know as soon as the funds were in hand to complete the project. In August, the stake pledges and final assessments were received in the treasury, and the contractor was told he could proceed to finish the project as soon as he had a crew available. The contractor responded promptly, and by mid-September, the building shell was in place, and members were anxious to have a chance to run trains again. However, the project was not yet complete. To occupy the building, we needed water, septic, power, and interior walls. We advised the local electric utility that we had installed the breaker box and weather head and were ready for them to hook us up for power. As we had the funds in hand, we advised the water and septic contractors that we were ready for them to dig the well and install the septic system. And one other item remained to be done before we could start the interior partitions, and that was to seal the concrete to avoid dust. After all, dust and model locomotives do not mix very well. So, another workday was scheduled for the end of September to accomplish this and other projects necessary to be ready to start construction of the interior partitions. These partitions were, in turn, necessary before the air conditioning contractor could install the A/C. By the end of the first week of October, the well and septic had been installed and inspected by the County and another workday scheduled for that weekend to run a power line and pipe to the well and to start the interior partitions. Workdays continued for each Saturday of October with individuals working on other days as they were available. By the end of the month, wall partitions were far enough along to allow the air-conditioning contractor to install the A/C units. Through November and early December, only two years after being evicted from our last home, work continued with the electrical wiring and plumbing being installed so that drywall could be put up. By early January 2001, clouds of drywall dust were being raised as seams were being floated and screw heads being covered and sanded. All were laboring to complete the drywall and the resulting dust ASAP so that modules could be brought to the clubhouse and trains run again. After all, it had now been over two years since we had a clubhouse with operating trains. Nevertheless, considering the fact that we were almost three years ahead of our 5-year plan, that was a small price to pay. In January and February of 2001 dry walling was completed and the odds and ends that were needed prior to operating trains were finished up allowing the modules to be brought to the clubhouse in early March. These were configured to allow the maximum number of modules to be utilized. For the first time in over two years, we could run trains in our own clubhouse, but this time it was ours, all ours!!! No decision had been made as to how long the modules would be used prior to start on the permanent layout, but finances and lack of inclination to start more work suggested that would not be anytime soon. Of course, our monthly business meetings were moved to the clubhouse as soon as possible, and the time was changed from the third Friday evening to the third Saturday morning. This change was mainly due to two factors; first, I-45 is a total disaster on Friday evenings, and also recognizing that most members were already at the clubhouse on Saturdays anyway. Of course all the work was not yet finished. Finishing details remained to be completed, such as hanging doors, molding, etc. And we had not done anything to the outside. Winter rains had made the driveway virtually impassable, so the hard topping of that would have to be a high priority. Nevertheless, a well-earned feeling of success ran throughout the club. It was time to play and enjoy for a while. The Greater Houston Model Railroad Show was scheduled at Humble, about 15 miles away, for late April at which we had a booth reserved to showcase our achievement. An open house was planned in conjunction with the show providing we could get the driveway improved in time to assure easy access to the clubhouse. Prior to the show, we did manage to get the culvert installed and to obtain a couple truckloads of crushed concrete to improve the worst areas of the driveway, so the open house could go on. The modules had been in storage for a couple years and needed maintenance badly prior to the open house. That became the priority for the two weeks before the open house. Another question had emerged over the past year as to whether we should go with DCC (digital command control) or stay with time tested DC. One member, Scott Kurzawski, brought a DCC unit to the clubhouse and installed it to power one of the two main lines on the modules so that members could run either DCC or analogue. It was noted that more and more members were installing decoders, so perhaps that question would soon resolve itself. Open house weekend came and attendance was as good as we could have reasonably hoped. All visitors were impressed with APN's achievement. One notable exception was that there were no visitors at all from any of the other model railroad clubs in the Houston area. Some in the other clubs had said that this could not be done. But life was good! We had trains running again, and they were running in our own clubhouse. Nobody could evict us again (as long as we paid our taxes.) And the DC or DCC question did pretty much resolve itself. Initially, the club was about equally divided between those favoring DCC and those favoring DC. One member stated "I have about 70 engines and I can’t afford to install decoders in all them!" Another member asked; "of those 70 engines how many do you actually run?" Answer; "8 or 10." "Then don’t put decoders in the other 60." A suggestion was made to power the layout with both DC and DCC. Possible, but not easy to accomplish. With it possible to run DC on one main line or DCC on the other, the holdouts were soon drawn in the far greater flexibility and realism of DCC. When the vote was finally called, it was a slam dunk for DCC, both for the modules and the permanent layout when built. So the question now to be addressed was what would the permanent layout look like and how soon would we begin work on it. What time period would be modeled? Would it be based on actual terrain, or from our own imagination? Would it be one main line or double main lines? What towns and industries? The questions were endless. More surveys were distributed and responses tallied. We ultimately concluded we would have a single main line with passing sidings. The era would be continuously current. The terrain would be that typically found from the Mississippi to the west coast. And at the same time, we also agreed on budgets for bench work and trackage, on electrical, and for scenery, and, more importantly, on a series of assessments to pay for all this. 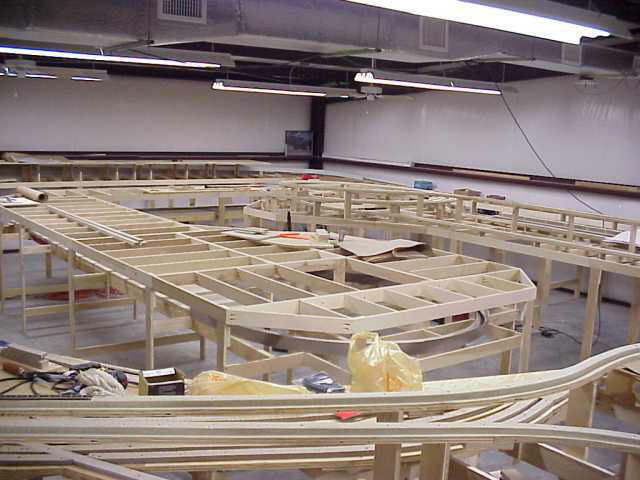 On February 1st of 2003, all the modules had been cleared from the clubhouse and work on our permanent layout started. 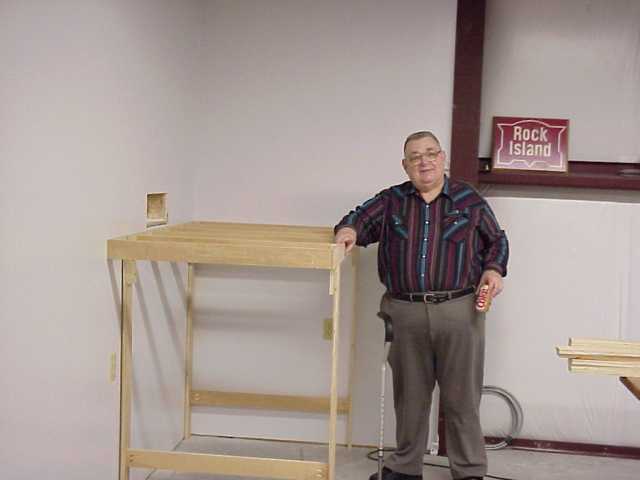 Duane Darling had devised a bench work plan and jigs to form the sections, so the bench work progressed rapidly. We had selected Russian birch plywood as it was made of twice as many layers as normal plywood and therefore was much stiffer. The laying of the main line rails also progressed rapidly. When these items were completed we could better envision how to develop the areas. Members were invited to plan a "town" (this could be a town, an industry, a scene, etc) and present their plan to the membership for approval. When the plan was accepted, that member became the "mayor" of that town and was responsible for its development. Rules were established for the authority of the mayors and what expenses were paid for out of the club’s budget and which were to be born by the member. Mayors were invited, even urged, to recruit other members to help with the construction of their towns. Mayors were free to develop the town according to their desires as long as it remained within the general context of the approval granted by the membership. The overall objective was to create rail traffic for later operating sessions but while still maintaining a visually pleasing railroad. It was desired to have all members involved in building the layout. Specialties developed according to one’s expertise in various areas and according to one’s areas of interest. Some were good at electronics, some in carpentry, some in scenery, and some in operation. In 2006, the club lost Steve Hashagen who was responsible far more than any other in the acquisition of our clubhouse. It was Steve’s vision, leadership, and determination that saw us through the whole process of acquiring the land and building the clubhouse and layout. Many of us suspected that Steve had lost his sanity when the project was first suggested. But Steve did not give up easily, and, as the facts and figures were carefully laid out on paper for all to see, one by one, the membership was convinced that, yes, we can do this! In recognition of Steve’s dedication and efforts, in July of 2006 at our 25th Birthday Party the clubhouse was dedicated as the Steven C. Hashagen Memorial Clubhouse. At about the same time, we had also lost another long time member, Stephen Foster. Stephen was particularly interested in the steam era, so the steam facility, now under construction, was named the Foster Yards. As of this writing, the main lines are complete and the track is nearing completion in the various towns. Club owned rolling stock has been acquired. Track detection and signaling are under way. Scenery is about one third completed. We have started operating sessions. Of course, plans change. Some things didn’t turn out to operate well or proved not to be pleasing as they took shape; so they were changed. We all realized this would be true and we know it will continue to be true. As it is said, life is a journey. It is the journey that is the object, not the end product. But one thing can be counted upon; most of us can look forward to a lifetime of (non-gainful) employment yet to come! A railroad is never finished!